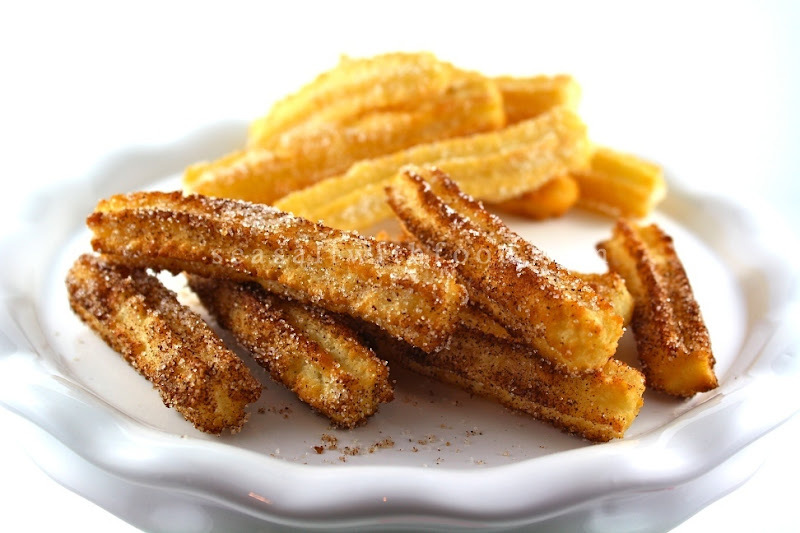 Typically sold warm by street vendors, Churros are fried strips of dough from Spain. Quick and easy to make, the dough is typically deep-fried, sprinkled with sugar or sometimes with cinnamon sugar. 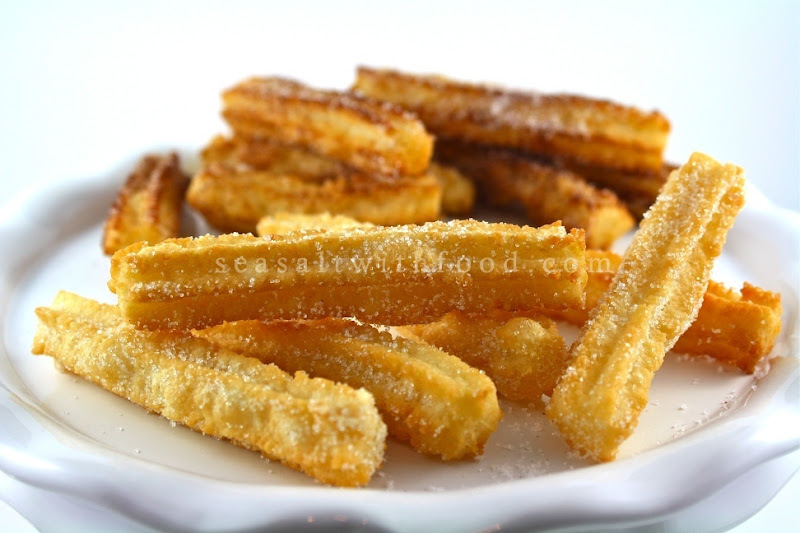 In my opinion, this is the perfect Churros recipe. Crispy and golden on the outside, but, the inside remains soft and fluffy throughout. My son quipped, “Once bitten, you will scream for more!” :-) How true! 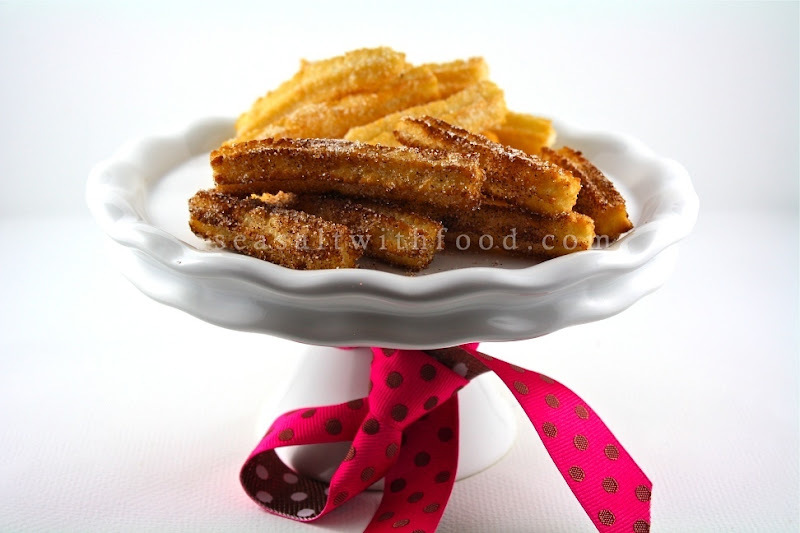 In any case, these Churros are simply scrumptious just on their own, don’t even need to dip them into any hot chocolate. Put it in a piping bag. Heat the oil to 185˚C (365˚F) (when a piece of dough is dropped in it should brown in 60 seconds). Force out long strips or rings of the batter into the hot oil, a few at a time. Fry for a few minutes until golden brown, then remove from the oil and drain. Sprinkle generously with sugar and cinnamon, if desired. We love churros, but haven't made them for ages. Did you not make the chocolate sauce too? The chocolate police will be visiting you if you didn't LOL. Oh Angie. You are making me crazy here. I haven't had breakfast yet. I will be thinking about these churros all day. These look so simple to make... great idea for a party snack. Thanks! ah ! Churros. Which reminds me I can make and dip them with dulce de leche.. great, thanks for sharing the recipe!! Ohhhhhhhh my god. Those look so good. Pipe in some cream, vanilla or chocolate ...droooool. I love churros! I recently had them when visiting Spain. I did dip them into hot chocolate and it was totally delicious! uh ohhh I tried this for the first time when I was in Surabaya. I haven't seen this since I moved to Winnipeg. do these taste like the ones they sell from costco or streetvendors? Will they be ok when cold. Thinking of making them a lunch box item. @rosemary:Churros taste better warm. Should be okay cold but; let it cool completely before store them in an airtight container. @Tia: I can't really comment on that. I have not try Costco Churros. I guess they probably tasted like street vendor Churros. @Swee San: I use a normal piping bag with the coupler. looooove churros! these sound and look great!